1. Melt 16 ounces of soap in the microwave. Color and fragrance based on your color preference. 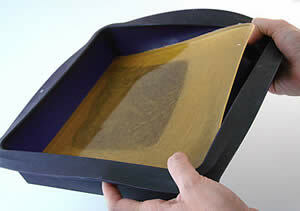 Place your silicone mold on a flat surface and wipe it out with an alcohol-dampened paper towel. This is to ensure your mold is clean and dust free. 2. Pour the soap into the mold and wait for it to fully harden. Once it is hardened, peel the soap out of the mold. 3. Most biscuit cutters will come with three to four sizes of cutters. Choose a large, medium and small sized cutter. Ideally, you want one cutter size in between the two sizes you choose. The larger cutter will be the “rind” size and the smallest cutter makes the “slices”. Push down firmly with the larger of the cutters until the entire flat piece of soap looks like a pockmarked slice of cheese. 4. Take the medium cutter cutter and cut out holes inside the larger circles. Save the medium circle cut outs and the round circle rinds. 5. Now, take the medium inside cutout circle and cut into it with the smallest slice. Save the round that comes from this for other fun projects to do with melt and pour. For the remainder of this Citrus Slice Soap Project, you will only use the large rind (step #3) and the small circular cut out (step #5). 6. Cut each small circle into definable citrus slices. 7. 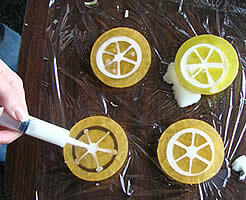 To make a realistic citrus soap, having a center adds to the effect. Carefully shave off a little snip of the tip with a small paring knife. 1. Pull out a piece of saran wrap long enough to hold all of your citrus slices. Carefully position your “rind” soap on the saran wrap. Pull the wrap tight to make sure there are no wrinkles under the “rind”. Do the best you can – the wrap never quite gets straightened or perfect. 2. 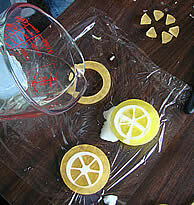 Spritz the “rind” and inside of the rind (onto the plastic wrap) with rubbing alcohol. Pour a thin layer of clear soap into the rind. 3. Spritz the thin layer of clear soap with rubbing alcohol. 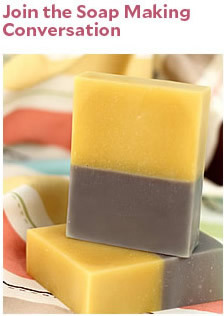 Place the “slices” into the clear layer of soap, before it hardens. Wiggle them into the perfect positioning. Have your paring knife handy just in case you need to slice off a too-large slice piece to ensure evenly spaced out soap. 4. Spray the entire set up with alcohol. Alcohol is your friend in this case. It helps with adhesion of the soap pieces. 5. Allow this clear layer to harden up prior to the next step. This usually takes 3 to 5 minutes at the most. If you do not allow your clear layer to harden up, the Lemon Slice below (upper right) is a good example of what happens – the white soap will leak out the sides of the slice. 6. Melt White melt and pour soap in the microwave, double boiler or whatever method you prefer. Make sure the white soap is not steaming or else it will melt your slices. For the Bramble Berry House Bases, 120 to 130 degrees is the best option for the overpour. 7. Spritz with alcohol. 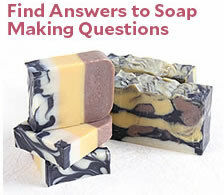 Using either a steady hand, you can pour directly into the middle of the soap slices from your heat safe container. The Melt & Pour Injector Tool is fabulous for this because it allows precision targeting with the white soap base. Using the Injector is my preferred method for this soap. It has less mess and trimming to work with after the soap hardens. 8. Give one final spritz and you’re all done. Allow the soap to harden. 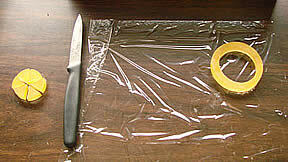 Peel the soap off the plastic, cut into slices or wrap whole.